Supplementary material reads: "Olmo Negs. 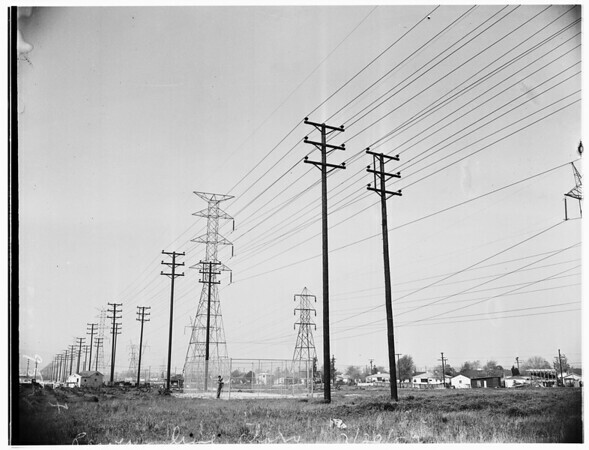 Power Line Story North Hollywood. 3-4: Picture shows foundation and fence which Ben Karron says is on his property illegally by the Dept. of Water and Power. 5-7: Mrs. Sally Sargent of 6138 Vineland Avenue shows how Department wants her to cut off 4 feet of her new studio building on her own land and the tower and poles which she claims are illegally on her property".